I posted a video over on my 2nd channel a while back – but have had lots more questions since. 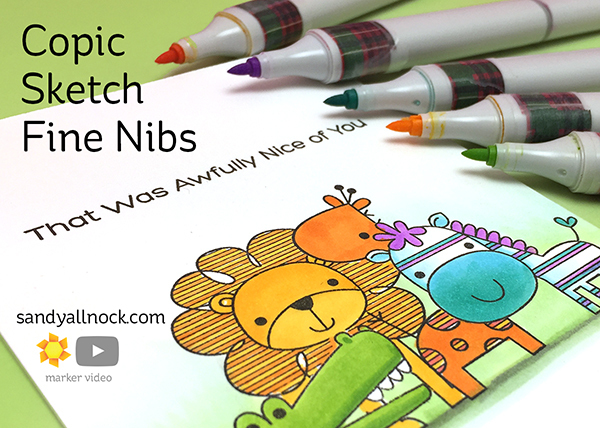 So today – a quick update with suggestions on choosing pens you might want to swap out nibs on! Watch the video below or click HERE to see it in HD on YouTube. Here’s the full clean and simple card – sometimes easy is best, eh? Thanks for the advice and neat card. Wonderful coloring and so adorable! Thanks for showing us these tips — a real play on words! Oh thank you! I bought a couple of packs of the new fine nibs a while back, and had all the questions you predicted! Now I have a better idea of how I want to use them and which markers I’ll want to change-out. Thanks, also for the valuable tip about not pushing them in too far – I probably would’ve ruined one nib, for sure! What WOULD we do without you?! So cute Sandy. Thanks for the info on the nibs, great advice.